As equity prices edge higher and climb the infamous “wall of worry”, the CBOE S&P 500 Volatility Index (VIX) has broken below key trend line support at 13.15 and now threatens to move lower still. 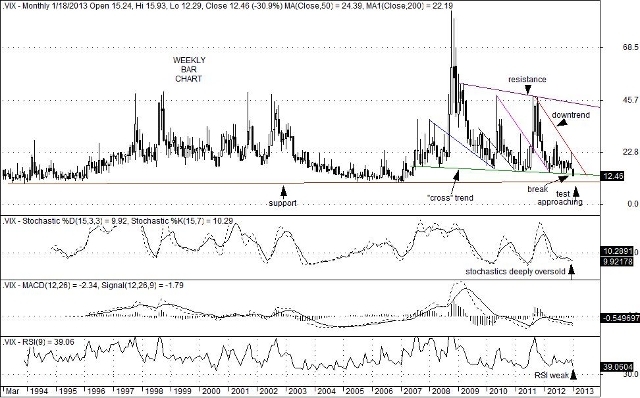 Although deeply oversold conditions are now present on weekly charts, the next major support level for the VIX sits at 9.35, a level not seen since December 15, 2006. If a move down to the 9.35 area were to play out, equity prices would likely hold steady, or more likely rise until then. That being said, the VIX (which is often referred to as the “fear index”) currently offers protection from an unexpected “shock” in the equity markets at a reasonable price. 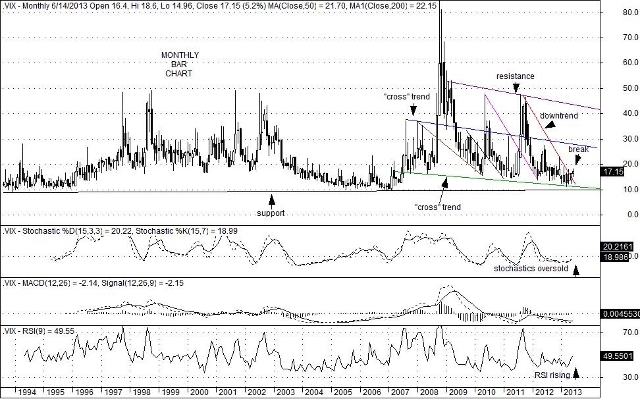 Nevertheless, “spot” VIX suggests that a “shock” to the market is not likely to occur over the next few weeks or so. Worries over a possible battle concerning the debt ceiling, or the sequestration, or the continuing resolution already appear to be priced in. Violence in various locations in the “Middle East” or in West Africa also seems to be priced in as well. Nevertheless, a more intense currency “war” appears to have launched by the new Japanese government in recent months that could put additional economic pressures on the Euro Zone and the U.S. And although it should take time for a new round of currency debasement to become a bigger factor for the equity markets to assess, an upward path in equity prices will likely continue for a little longer. At some point, however, a bit of inexpensive volatility protection may become more valuable as future economic events unfold.